This line of 100% Rayon Chenille is designed for use by Handweavers and comes in a selection of 34 beautiful colours. This 1,450 yards per pound (2,923 m/kg) yarn can be woven using a sett of 12 to 16 epi. The yarn comes in 1/2 lb cones and pricing and quantity discounts are shown below. NOTE: This Rayon Chenille is colourfast which is not always the case, especially for lower priced Chenille yarn! Rayon Chenille can be used to make wonderful towels, bathrobes, soft sweaters and bathmats. Unlike most yarns which are spun from a raw fiber, Rayon Chenille is actually constructed in a process similar to weaving. 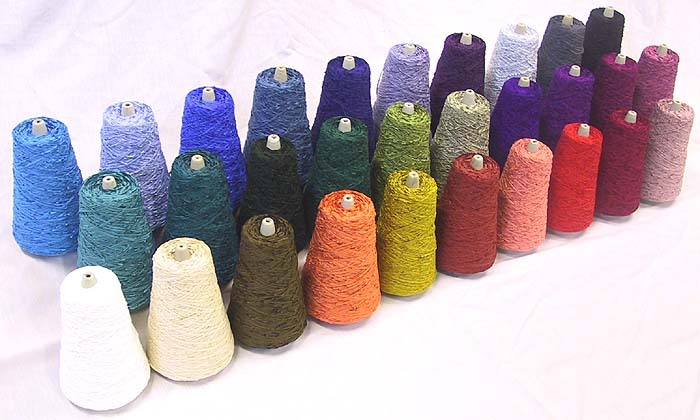 The yarn is produced using a centre strand made up of very tightly wound, long fibers. Shorter, softer fibers are then spun into these center strands to give the yarn the appearance of a very thin woven fabric. The long, sturdy center strand gives the yarn its durability, and the short pieces gives it the soft feel. Because the Fibres used to construct Rayon Chenille are from wood pulp, most consider it a natural fiber. 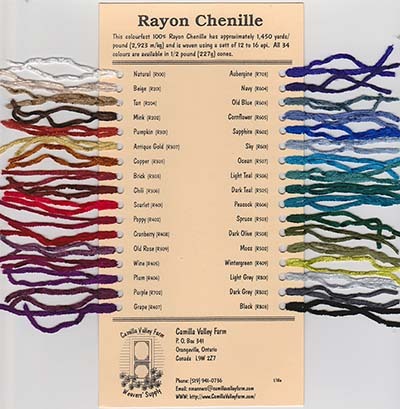 Note that a number of the Rayon Chenille colours match those used in our Tencel yarn enabling the weaver to create many effects by mixing the two yarns in the warp or weft. 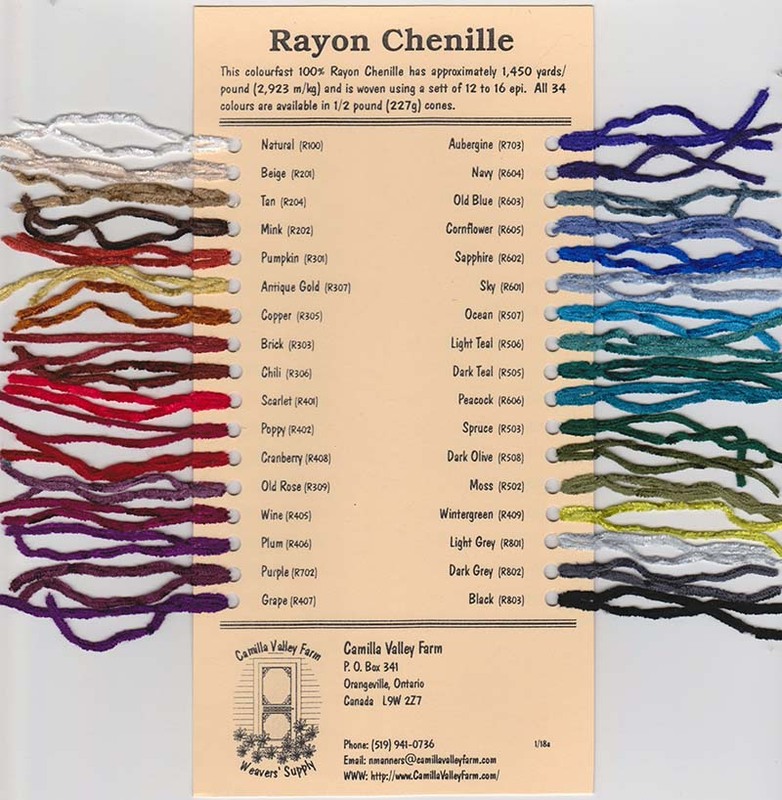 A Sample card that shows all of our Rayon Chenille colours is shown below (click on the picture for a larger version). While it provides a fairly accurate reproduction of the colours and sizes, their appearance can vary from computer monitor to computer monitor. Contact us for information on how to order our sample cards.